The Oaks Armada Floor Lamp is in an Antique Chrome finish with a white lampshade. The Oaks Armada Swing Arm Floor Lamp is in a Polished Brass finish with a fabric shade. The Elstead Audubon Double Wall Light features black and tan striped shades. The Elstead Belfry Single Wall Light offers hand-crafted metal work in a black finish and a truly medieval design. The Firstlight Bow Extendable Wall Light is in an Antique Brass finish. The Firstlight Bow Extendable Wall Light is in a Brushed Steel finish. The Elstead Chartwell Single Wall Light features delicate scrolls and a hand-worked wire bound arm in a Black finish. The Franklite WB986 is a Chrome finish modern wall light with off-white fabric shade. The Firstlight Clio Wall Light has a ribbed Cream fabric shade. The Oaks Cobra Cast Brass Table Lamp is in a Polished Chrome finish with a fabric shade. 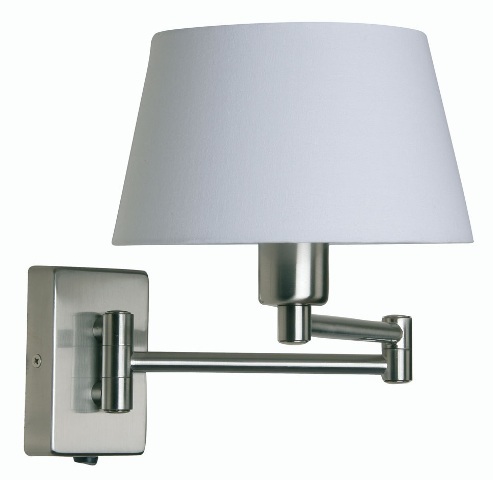 The Firstlight Conrad Wall Light 5931CH is in a Chrome finish with a cream shade. 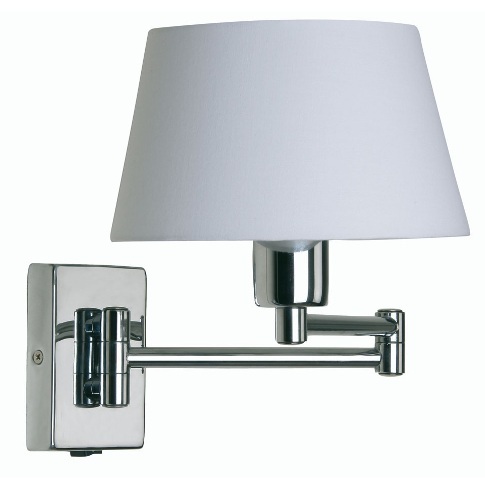 The Firstlight Conrad Wall Light 5932CH is in a Chrome finish with a cream shade. The Kolarz Delphi Floor Uplighter is a stylised, striking floor lamp in a Chrome finish. The Kolarz Delphi Floor Uplighter is a stylised, striking floor lamp in a Gold finish. The Firstlight Fairmont 3 Light Chandelier is in a Polished Stainless Steel finish with Cream linen shades. The Firstlight Fairmont 5 Light Chandelier is in a Polished Stainless Steel finish with Cream linen shades. 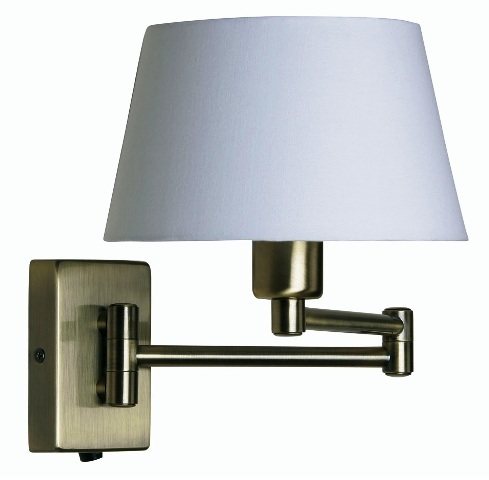 The Firstlight Fairmont Single Wall Light is in a Polished Stainless Steel finish with a Cream linen shade. The Firstlight Fairmont Wall Light is in a Polished Stainless Steel finish with a Cream linen shade and an LED reading light. The Elstead Falmouth Bathroom Wall Light is in a Chrome finish with a black shade and a secondary light source illuminating the frame for a romantic glow. The Elstead Falmouth Bathroom Wall Light is in a Gold finish with a white shade and a secondary light source illuminating the frame for a romantic glow. The Firstlight Fargo Single Wall Light is in a Brushed Steel finish with a cream fabric shade. The Firstlight Fargo Wall Light with LED Reading Light is in a Brushed Steel finish with a cream fabric shade. The Firstlight Grand Single Wall Light is in a Brushed Steel finish with a cream fabric shade. The Firstlight Grand Single Wall Light with LED Reading Light is in a Brushed Steel finish with a cream fabric shade. The Firstlight Lex Wall Light is in a Polished Stainless Steel finish with a cream fabric shade. The Firstlight Lex Wall Light is in a Polished Stainless Steel finish with an oyster fabric shade. The Elstead Madison Manor Wall Light by Quoizel Lighting is in an Imperial Silver finish with glass accents and a white linen shade. The Firstlight Mansion Standard Lamp is in a Polished Stainless Steel finish with a cream fabric shade. The Firstlight Mansion Table Lamp is in a Polished Stainless Steel finish with a cream fabric shade. The Firstlight Mansion Single Wall Light is in a Polished Stainless Steel finish with a cream fabric shade. The Firstlight Mansion Wall Light with Reading Light is in a Polished Stainless Steel finish with a cream fabric shade. The Firstlight Melrose Table Lamp is in a Polished Stainless Steel finish with a cream fabric shade. The Kansa Pineapple Torchiere Wall Light has Old Gold metalwork with an etched mouth-blown brilliant cut glass shade. The Kansa Pineapple Wall Light is a traditional Antique metalwork wall light with etched mouth-blown brilliant cut glass. The Firstlight Prince Polished Stainless Steel Wall Light has a Black fabric shade and an LED reading light.. The Firstlight Prince Bronze Table Lamp has an Oyster fabric shade. The Forstlight Prince Wall Light is in a Bronze finish with an oyster fabric shade. The Firstlight Prince Polished Stainless Steel Wall Light has an Oyster fabric shade and an LED reading light. The Firstlight Prince Polished Stainless Steel Table Lamp has an Oyster fabric shade. The Firstlight Prince Polished Stainless Steel Wall Light has an Oyster fabric shade. The Firstlight Prince Polished Stainless Steel Table Lamp has a Black fabric shade. The Firstlight Prince Polished Stainless Steel Wall Light has a Black fabric shade. The Firstlight Princess Polished Stainless Steel Wall Light has a Black fabric shade. The Firstlight Princess Polished Stainless Steel Wall Light has a Cream fabric shade. The Firstlight Princess Polished Stainless Steel Wall Light has an Oyster fabric shade. The Firstlight Raffles Single Wall Light is in a Brushed Steel finish with a cream fabric shade. The Firstlight Raffles Wall Light with LED Reading Light is in a Brushed Steel finish with a cream fabric shade. The Oaks Riley Wall Light With Flexible LED Reading Light is in an Antique Brass finish. The Oaks Riley Wall Light With Flexible LED Reading Light is in an Antique Chrome finish. Luxury Lighting supply a large range of hotel bedroom lighting and guest room lights in modern and traditional designs. A selection of quality bedside wall lights, bedside table lamps and floor standard lamps for a hotel bedroom or guest room. Hotel bedroom lighting and guest room lights to suit all your needs.